The International Masonry Institute (IMI) and the Tile Contractors Association of America (TCAA) kicked off the 2019 Tile & Stone Seminar Series in Philadelphia last month. The nine city series opened with their first event held at the BAC Local #1 Training Center in Philadelphia, PA. NAC had a tabletop exhibit and more than 40 people attended the half-day event. 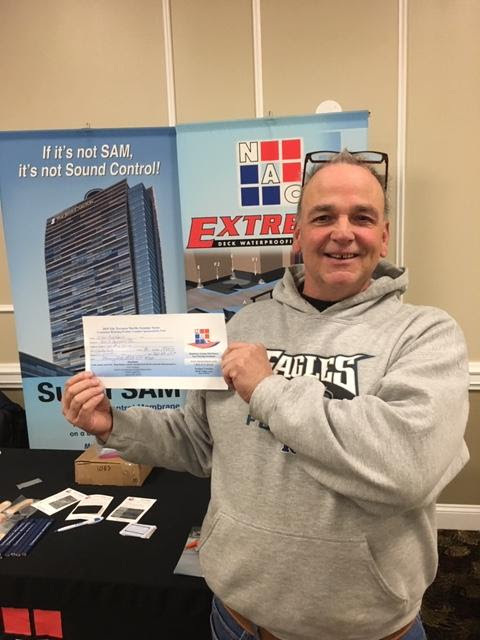 John Buchanan from BGB Ceramic Tile Specialists, Inc. in Landenberg, PA won the NAC gift certificate in the contractor drawing. John Buchanan, BGB Ceramic Tile Specialists, Inc.
others an opportunity to earn continuing education credits. The half day program includes seminars and exhibits and is registered with the AIA for 4.0 learning units. BAC tile and stone contractors receive 4.0 hours toward IMI Contractor College and TCAA Trowel of Excellence continuing education requirements. The program features presentations on interior and exterior tile and stone installations, the critical points of design and installation and a panel discussion focused on local issues featuring local suppliers, contractors and other industry experts. In between the presentations, attendees will have an opportunity to interact with material suppliers and other industry representatives at table top exhibits representing all facets of the tile and stone industry. The next event will be held in Pittsburgh at the Bricklayers & Allied Craft workers Local #9 on Wednesday February 13 beginning at 7:15 AM. For more information, to register and to see the whole list of cities and dates, click here or visit www.imiweb.org or www.tcaainc.org.